Most American adults identify with a religion, describing themselves as Protestants, Catholics or Jews, to name just a few examples. But a new Pew Research Center analysis looks at beliefs and behaviors that cut across many religious identities, producing a new and revealing classification, or typology, of religion in America. The new typology sorts U.S. adults into seven cohesive groups based on their answers to 16 questions about their religious and spiritual beliefs and practices, the value they place on religion, and the ways they find meaning and fulfillment in life. Three of the seven groups are composed of highly religious Americans who are united by a traditional view of God and by the shared conviction that organized religion is generally a force for good in American life. Sunday Stalwarts are the most religious of the seven typology groups; they have a high level of involvement in religious congregations and actively practice their faith. God-and-Country Believers are less active in church groups or other religious organizations, but, like Sunday Stalwarts, they hold many traditional religious beliefs and tilt right on social and political issues. The Diversely Devout includes a relatively large share of racial and ethnic minorities. They are also diverse in their beliefs: It is the only group in which most people say they believe in God “as described in the Bible” and in which majorities say they believe in psychics, reincarnation and that spiritual energy can be located in physical things like mountains, trees and crystals. At the opposite end of the spectrum from the three highly religious groups are two nonreligious groups characterized by their tendency to seldom or never attend religious services, rarely pray, and to reject belief in the God of the Bible – instead believing in another higher power or spiritual force, or in no higher power at all. The Solidly Secular are the least religious of the seven groups. These relatively affluent, highly educated U.S. adults – mostly white and male – tend to describe themselves as neither religious nor spiritual. 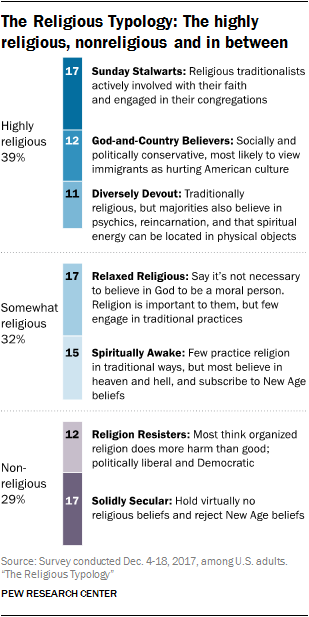 Religion Resisters, on the other hand, largely consider themselves spiritual but not religious. Another unifying characteristic is their opposition to organized religion. In between the three highly religious and two nonreligious categories stand two additional typology groups – the Relaxed Religious and the Spiritually Awake. Most Relaxed Religious Americans say they believe in the God of the Bible, and four-in-ten pray daily. But relatively few attend religious services or read scripture, and nearly all say it is not necessary to believe in God to be a moral person. All Spiritually Awake Americans hold at least some New Age beliefs (e.g., in psychics or that spiritual energy can be located in physical objects) and believe in God or some higher power, though many do not believe in God as described in the Bible and relatively few attend religious services on a weekly basis. While these typology groups were assembled without regard to religious affiliation, it is still revealing to analyze the religious composition of each group. Each has its distinguishing markers, but none of the typology groups is religiously uniform, and every major religious tradition is represented within multiple typology groups. Sunday Stalwarts, for example, are largely Protestant but also include Catholics, Mormons, Jehovah’s Witnesses and Jews. And while most Solidly Seculars are religiously unaffiliated, their ranks also include Americans who identify as Protestants, Catholics and Jews, among others. Becka A. Alper is a research associate focusing on religion at Pew Research Center.